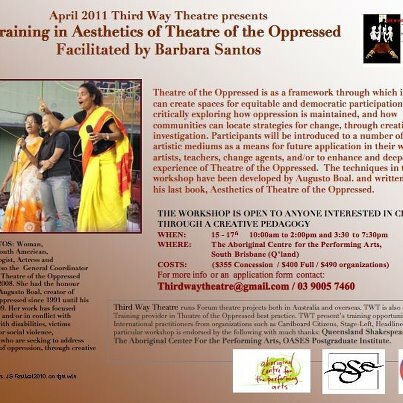 Over the last ten years Third Way Theatre has facilitated training workshops covering a range of techniques included in the arsenal of Theatre of the Oppressed techniques systematized by Augusto Boal. Asides from facilitating training ourselves, we have also hosted workshops with International practitioners. Our intention is to create opportunities for people within Australia, especially those who might not be otherwise able to access training abroad due to costs of travel, accommodation, etc; with practitioners with an extensive body of experience in the direct application of the work in community contexts. To date the following International TO practitioners have presented training workshops to and for community.